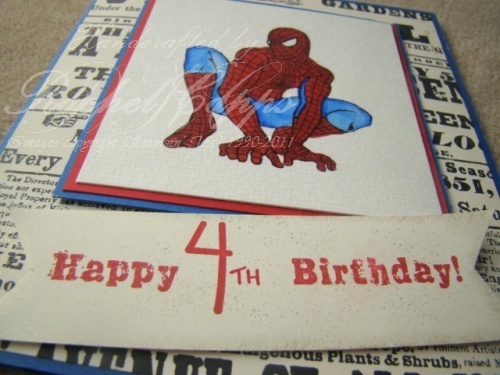 This is a special card I made for my youngest son on his 4th birthday this year. 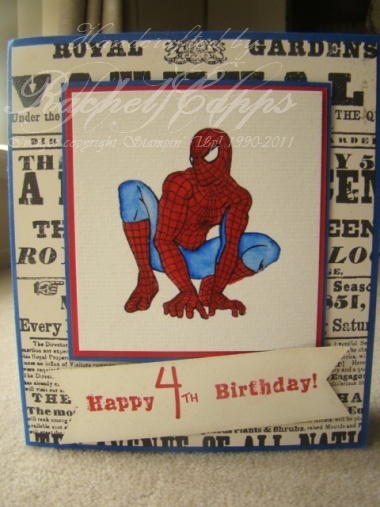 I used Real Red and the retired colour Brilliant Blue to get Spidey’s bright colours. I found an image on the internet of Spiderman, then I printed it on Watercolour paper. I used my marker pens to colour in Spidey – really easy to do! The sentiment is from the stamp set Grunge Rock, stamped in Real Red. The background is from the now retired Newsprint DSP – I thought the Newsprint well suited Spidey as he’s always in the headlines, lol! This is a card I made for a recent stamp-a-stack for a lovely lady who wanted to share stamping on her birthday – what a simply wonderful idea! Don’t you agree? This is the other card that was inspired by one of my favourite cards here. I began with the colours Very Vanilla, Blushing Bride, Crumb Cake and Certainly Celery. We used the Scallop Trim border punch with a strip of Crumb Cake cardstock, which was layered with another strip of Certainly Celery DSP (from the Subtles DSP Paper Stack). 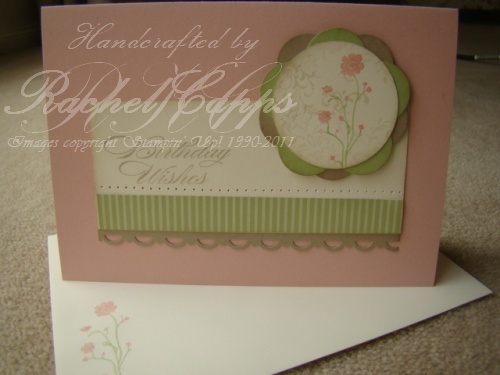 We stamped the sentiment from Bring on the Cake on the Very Vanilla cardstock and sponged the edges. For the flowers, we used Silhouette Sentiments with the Blushing Bride and Certainly Celery marker pens. The background of the flower circle was stamped in Crumb Cake with a “stamped off” stamp from the retired SAB stamp set, Bliss. For the border around the flower circle, we punched the Fancy Flower punch with Crumb Cake and Certainly Celery cardstock. A row of paper piercing finished off the card. My mother-in-law had a big birthday recently – for politeness, I won’t say which big number 🙂 We had a simply special celebration at a restaurant with family and friends – it was a wonderful night – and this is the invite I made to send out to everyone. 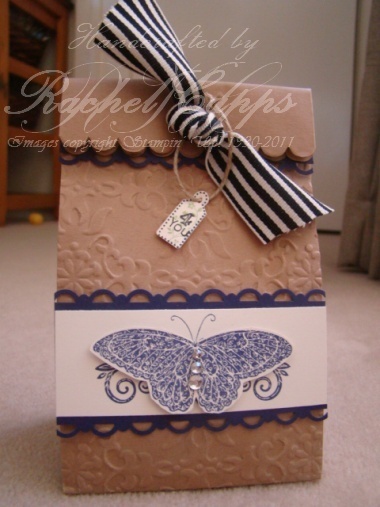 I fell in love with this card here and it inspired me to make the invitations. It also inspired me to make another card, which I’ll post shortly. 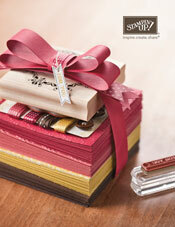 To make this card, I used the colours Crumb Cake, Very Vanilla, Blushing Bride, Early Espresso and Certainly Celery. I popped the Blushing Bride background through the Big Shot with my Vintage Wallpaper embossing folder, then I sponged the edges with Crumb Cake. I used the Scallop Trim border punch with a strip of Crumb Cake cardstock to layer along the bottom of my stamped image, together with a strip of Certainly Celery striped DSP (from the Subtles DSP Paper Stacks). I then used the retired Sale-a-bration Bliss stamp set to stamp in Crumb Cake around the edge of my Very Vanilla cardstock (and sponged the edges with Crumb Cake ink). I tore the top right corner and sponged the tear in Crumb Cake ink. Then I stuck a snippet of Newsprint DSP under the corner. Using Silhouette Sentiments and my Certainly Celery and Blushing Bride marker pens, I used marker-to-rubber and stamped the flowers in a row. The bird was then stamped in Early Espresso ink. For the sentiment, I punched some Certainly Celery cardstock with the Decorative Label punch. Then I stamped with Bliss in “stamped off” Crumb Cake ink and added a flower from Silhouette Sentiments using my marker pens. 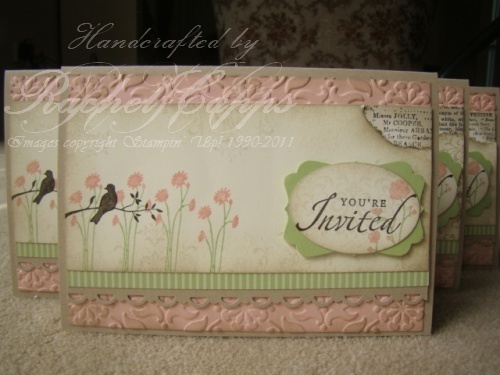 The “You’re Invited” is from a great favourite stamp set of mine – Sincere Salutations – and is stamped in Early Espresso ink. Again, I sponged the edges of the punched out Extra-Large Oval in Crumb Cake ink.